It’s not just another burger, it’s one with a South Indian twist. 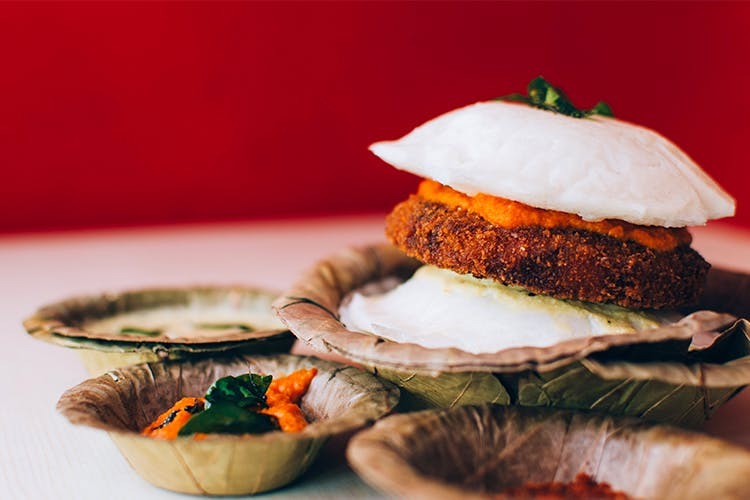 The crusted patty is made from fried pieces of rice idli and smeared with a tangy chutney. 1.Heat oil and fry idlis till golden brown. Make sure they’re crisp on the outside and soft on the inside. 2.Apply chutney on each side of the idli. 3.Boil diced vegetables till well done. Drain water and allow them to cool. 4.Saute onion, add ginger-garlic paste, turmeric, chilli powder, coriander powder and garam masala. Saute for a couple of minutes and then let it cool. 5.Mash the vegetables and onion mixture. Add maida, coriander leaves and salt to taste, mix well. 6.Make cutlets that are about the same size as the idlis. Shallow fry cutlets till golden brown. 7.How to assemble burger – Place the cutlet in the middle, and then add onion and tomato slices sandwiching the cutlet.